Platt’s were long time members of the Wyoming Outfitters and Guides Association. Each year the Association has a Big Game Awards Competition for members’ clients. Since 1976 our clients have consistently won awards (a total of 83) including 30 for antelope, 8 for deer, 2 for elk, 18 for bear, l6 for lion and 9 for Big Horn sheep. 2012 was a particularly good year for antelope! Wyoming Game and Fish Department - Online electronic application service, apply for licenses and permits issued through drawings, purchase preference points, apply for Super Tag licenses issued through drawings. 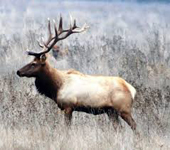 Unparalled adventure hunting for high altitude eld and/or deer, plus muzzle loader and archery hunts for elk or deer. Drop camps and “Super Camps” are also available, only in September. As the leaves fall and the air becomes crisper, the Medicine Bow Mountains (forest &wilderness) provides for our Wyoming Bull elk hunting. Cow season generally extends into November, giving the meat hunter opportunities to fill the freezer at a reduced cost. All bull elk, some deer and cow hunts require riding. A weight limit of 250lbs is placed on anyone riding a horse for safety. 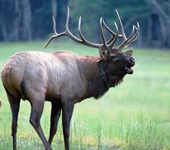 APPLY for ELK licenses by JAN. 31st. DEER & ANTELOPE by MARCH 15th. As the aspen begin to turn yellow, October rifle season for mule deer opens. 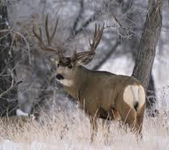 Trophy bucks are found on the ranch, and in the surrounding mountains and wilderness areas. Sage brush, bitter brush, aspen and pine are abundant. The best opportunity for a trophy buck is the later season hunt and it requires maximum preference points to draw this tag. Providing everything a deer needs to produce big antlers. Deer are hunted on horseback, walking, and/or 4x4 from a camp or lodge. Currently, Wyoming Fish and Game has late season on hold, but you can build preference points for future hunts. We are currently doing a limited number of hunts on private and surrounding lands. 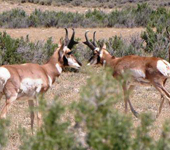 Archery hunts begins with Pronghorn antelope in August, followed by mule deer and elk in September. Located in Carbon County, producers of more record book antelope than any other county in the world, our clients enjoy the privilege of hunting for record book pronghorn!! Drawing odds vary by area, some require no preference points, however, it is always wise to apply for preference points. Most hunts are conducted from camp by a 4x4, walking and stocking. Some of our areas may require preference points, which you should always apply for. 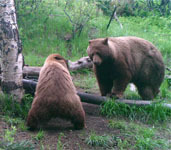 Wyoming offers opportunities for SIX species of Big Trophy Game, beginning with spring Black Bear. Based at our lodge, we hunt the foothills of the Sierra Madre Mountains. A female mortality quota system has increased our population and the area can produce exceptionally large bears, as well as color phases. Licenses can be bought over the counter. There’s plenty of time during the day for fishing and varmint shooting. The Encampment area offers the "World's Capital" on ground squirrel shooting. 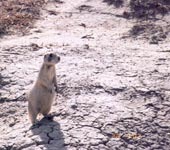 An unlimited amount of shooting for varmints and prairie dog is available from May through August. Coyotes make an excellent trophy when taken during the winter months. This hunting is done on private land through arrangements we have made with the landowners.